Trends in the US mobile phone market from July 12 to October 12, 2012 still show Android holds the most market share according to surveying done by comScore. All the various Android users account for about 54% of the market based on a study of more than 30,000 mobile subscribers. iOS came in second at 34%. The most significant movement was seen with Apple's rank in manufacturer standings. 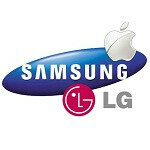 Samsung remained the top manufacturer, with a commanding a little more than 26% of market share, up 0.7%. Apple came in second for the first time at 17.8%, just a couple tenths ahead of LG at 17.6%. Apple made a strong gain for a period where for only a fraction of the time the new iPhone was available. LG lost 0.8% share. Motorola held steady at about 11% and HTC slid 0.4% to 6%. While Android and iOS dominate nearly 90% of the market in terms of mobile OS, RIM still holds on to third with 7.8% even after a further 1.7% decline in market share. Microsoft saw a decline of 0.4% to 3.2% overall. Symbian is still registering a pulse at only 0.6%, a 0.2% drop from the previous survey. The next quarter’s survey will be the one to watch for a lot of reasons. First, the iPhone 5 will have been available for the full period, so we will be able to see if the gains were the initial swell from the new device or if they were gains through attrition of LG's losses; second, Windows Phone will have been available for most of the new survey period; and third, Samsung’s position, while certainly remaining on the top, will be interesting to see how its growth is affected with all the new devices it has just released, and we can see how effective it is at fending off Apple’s advance. We do not expect RIM’s position to improve nor do we expect Nokia to make a showing, but anything is possible. For the loyal followers of Symbian, that OS just seems to hang on. So while this quarter’s report is interesting in terms of Apple’s movement, next quarter’s is going to be really interesting to see how the market plays out. If we do not see major movement by Microsoft and Windows Phone, even if it does not take third place from RIM, that leaves RIM with a gaping hole of an opportunity to hit it big in January with the release of BlackBerry 10. Next quarter will probably be too soon to see if HTC's change in marketing strategy has been effective. In the meantime, Android remains on top of the world. Can but likely won't. They created a flagship phone but put it only on Verizon and gave it only a 10 hour battery. Should have followed Apple and Samsung's lead by releasing the DNA on all carriers and should have given it a Razr Maxx equivalent battery to truly make it a flagship device, one that would bring them back from their sinking profits. Obviously they can't... They've broken the 2012 promise they made about maintaining their current phones. I'm speaking as an EVO LTE owner on ICS. Phone also has bugs that haven't been addressed for months. That's the first thing I thought when I saw this. Yep, did people think their share would go down after releasing a new model? Text is misleading. Smartphone OSes only, not entire mobile market. This is old data, there are new reports that iPhone has overtaken Android in US for last 12 week sales. That's perhaps b-c Nexus 4, DNA, Optimus G, Notes 2 have not been in the market yet or for very limited time. But overall you're right, Android will do much better than at the same time last year. by last year yoou mean? perhaps you wanted to say next year. This is the link http://allthingsd.com/20121127/iphone-overtakes-android-in-the-u-s-android-extends-lead-abroad/ Next time get the fact right before talking. are you forgetting that in actual term of profits, google and samsung combined with MS have less profit than apple. i dont like apple but i like reality. No, not combined with Samsung, silly. That would yield about 15billion. Get your figures right. I'm glad to see Motorola is still hanging in there at 11%. Hopefully with Google in control that number starts to go up again. In android 2.x I wasn't fan of Samsung's TW...but in 4.x samsung has made TW lovable...now people shying away from Android will come back for features missing in other platforms/devices...I think Samsung will see bump in share in next results. I only start noticing samsung after apple sue them. Now i am using more of their products including a phone and a tablet. Thinking of getting a new samsung refrigerator to replace my old one. Yup..touchwiz isn't that bad. Granted, it's not a work of art but it's very good in terms of function. Fell in love with touchwiz since the launch of SGS2. Always looks at YoY data rather than daily figures which makes no sense. Honestly, neither of them has a shining future. I don't get it.. this survey shows a comfortable lead for android(which makes every sense) while the other one claims ios overtaking it during the same period. What gives? No, the survey is until Oct 12 only, and iOS overtook Android in 12 week period ending late Nov.
Meo, iOS did not overtake Android for the 12 week period shown - the chart and figures show that Apple gained the most percentage of marketshare in that time period over other OEMs, but that Google had the greater gains when looked at from an OS point of view. Not sure why these charts are a big deal - who really knows how accurate they are and what do we consumers gain from them - nothing - unless, people buy a phone/OS just to be number one. I bought my iPhone my one x and every other phone I've owned cuz I liked em. I can care less about who's #1, who leads in market share, or who's stock is rising/falling. I drive a bus n vegas, so all I care about is reporting to work on time cuz LV transit pays me. Not Samsung Apple, or google. Android users don't object to people buying Apple products because that goes against being objective and having more choices in the markets. Apple fans have no need of choices and worship apple as a single brand that could fulfuil all their computing needs. Not that its a bad thing. For me i used to buy a lot of apple products, Just that i find them disgusting of late with 100 billions war chest that is dedicated to limit my choices to choose and get a good deal. I want apple to put effort in coming out better product to compete not lawsuit that bring me zero benefits. Brand loyalty was never a question till my own benefits is at stake. Have I ever said it was a big deal, I just said about what I read. This is always not 100% accurate about these things but at least research is always better than guessing. The report also said US was the only market that iOS barely beat Android. I also so said I thought this would change when new top Android phones enter market in US.